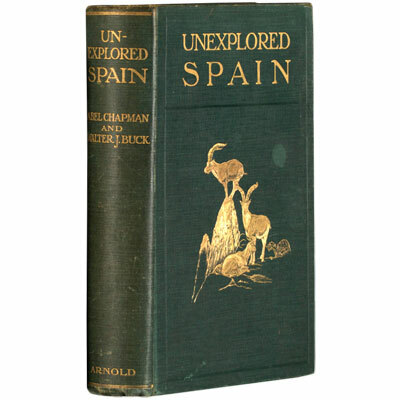 Unexplored Spain - Abel Chapman, Walter J. Buck 1910 - Edward Arnold, London - First Edition	An excellent copy of this influential work on Spain and its wildlife, with chapters on the historic hunting ground of Coto Doñana, Andalusia’s big game, wildfowl and wild geese, the Spanish bull fight, flamingoes, wild camels, the highlands of Asturias, Valencia, and sketches of Spanish bird life, together with an account of the Spanish ibex, which Chapman would go on to save from extinction. This copy was gifted by Heatley Noble, renowned ornithologist, author, and one of the half dozen best shots at Grouse and driven Pheasant in the kingdom during the early 1900’s. While the authors’ main focus is on larger mammals and game birds, they also deal with smaller birds, reptiles, insects, and plants of the area, as well as offering some insight into Spanish society at the time. It was Chapman who first discovered that Spain was the main breeding place of flamingoes in Europe, and drew attention to the area’s importance as a migratory route. Chapman and Buck formed a shooting syndicate that rented the Coto Doñana for several years. Their collaboration and publication of this book – composed in an interesting and accessible style – would go on to inspire generations of British naturalists. Abel Chapman (1851-1929), born in Sunderland, was a British field naturalist and hunter. He saved the Spanish Ibex from extinction and assisted in the establishment of South Africa’s first game reserve. Walter J. Buck (1843-1917) was British Vice-Consul in Jerez and a wildlife enthusiast. Provenance: Heatley Noble (1862-1922). Obituary - British Birds Rarity Committee (Vol.XVI). – Heatley Noble, who died at his residence “Temple Combe,” Henley-on-Thames, on March 26th, 1922, was born on June 4th, 1862, the third son of the late John Noble of Park Place, Remenham, Berkshire. Although Noble severed his connection with the British Ornithologists’ Union and B.O. Club several years since, he was too good a man and ornithologist to be let fall out of the ranks unnoticed. Though a salmon fisherman, deer-stalker, and one of the half dozen best shots at Grouse and driven Pheasant in the kingdom, the living bird was Noble’s life-interest, and its egg, if taken by his own hand, his most cherished trophy. Many years ago he sent to the hammer an immense and authenticated collection of eggs of the Palsearctic region, and recommenced and carried to a large degree of completeness a new collection of his own taking. To make this he travelled in Spain, Hungary, Iceland (and isles north of Iceland), the Dovrefjeld, Scotland, and elsewhere. On one of these expeditions he was accompanied by the late F. C. Selous. No day was ever too long, nor any country, or sea, too rough for Noble when on the war-path, but he was neither exterminator nor dealer, merely a naturalist-sportsman. He knew our native birds intimately, and was (I think) the first to find Scaup breeding in the British Islands, and surprised Scottish naturalists with eggs and down of Pintail from Loch Leven. His collection of young-in-the-down was extensive and valuable. As a schoolboy he reared a young Honey-Buzzard almost from the first plumage, and discovered that the books are wrong, and that the chick must have honey-in-the-comb for some weeks before it can assimilate wasp-grubs. He proved that the young bird when feathered will attack the first wasps' nest it sees, dig it out unaided and gorge the grubs. He was a fine type of field-naturalist, always learning, and as grey hairs accumulated developed literary tastes, archaeological and scientific, compiling a summary of the Birds of the Palsarctic region, a List of the Birds of Berkshire and Oxfordshire ; a history of Park Place, Henley, and notes on the Four-horned sheep, etc. In fact, he was perpetually and indefatigably busy, and during the Great War (in which he lost his second son) worked at crutch-making until his health was affected; for even his muscular system was not equal to twelve hours a day at top-speed. I remember during the war his making annual efforts(all ineffectual) to add to the food resources of the country by systematic collection of rock-birds' eggs. The Government Department delayed until autumn. He acted as deputy Chief Constable for a rural district, and kept the authorities informed as to its resources in horses, carts, etc. As a youngster up at Cambridge Noble was a bold but rather unlucky rider. In later years his affection for, and knowledge of rare British and foreign trees were remarkable, and his skill in forestry extraordinary. I have known him save a tree entirely " ringed " by rabbits with a jacket of clay reinforced by wire-net. He was equally clever in the management of machinery—and men. As host, friend and genial companion, many of us found him almost incomparable. He was a well-informed, modest and kindly gentleman of a delightful type.’ – H. M. V.
References: Britishbirds.co.uk. The Spectator Archive 1928, web. Cantelo, ‘Pioneering British Ornithologists in Andalusia’ Birding Cadiz Province, web.